So Sound Recordings, Headtunes and Lost My Dog are joining forces at Miami WMC 2010 with a DJ line up that should instantly get the mouth of any self-respecting deep house fan watering. 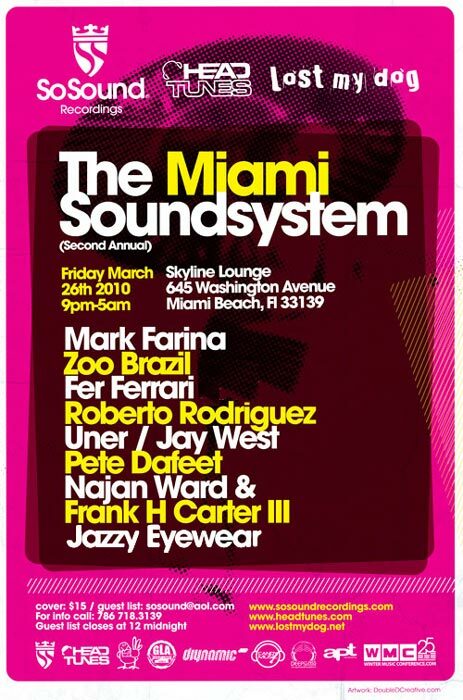 ‘The Miami Soundsystem’ takes place on Friday 26th March at Skyline Lounge in the heart of Miami Beach and see’s the legendary Mark Farina (Om Records, Great Lakes Audio) headlining a bill which also includes Uner (Diynamic), Jazzy Eyewear (So Sound), Jay West (releases on all of the host labels), Pete Dafeet and Najan Ward (Lost My Dog). Najan Ward will be joined by very special guest and brand new Lost My Dog signing Frank H Cater III for a live vocal performance. This one is not to be missed as three of the finest underground house labels go head to head.